The Tourist Information Centre, located at 2 Victoria Road, Saltaire, closed on 4th January 2007. The information below was located in the Business section of this site, and has now been relocated here, in History. Anne and Roger Heald have closed their doors at the Tourist Information Centre on Victoria Road. It's sad for Saltaire. We know you're not going to be far away, but we will miss the TIC. Good luck, Anne and Roger. Please let us know your plans for the future. 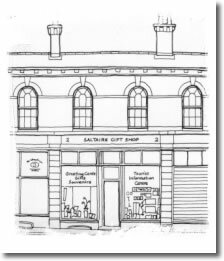 Saltaire's Tourist Information Centre is on Victoria Road, almost opposite Salt's Mill. Besides providing information on the village, the Tourist Information and Gift Centre can also arrange guided walks for groups and individuals. Accommodation at Overlooker's Cottage or Salts Apartment can also be arranged through the Tourist Information and Gift Centre - please contact us for further details. You can pick up a copy of the Saltaire Sentinel from here.